The reason this might occur is the following. 6) You exit maintenance mode and start using your ESXi host. The problem is your vCenter Server doesn’t know you did an ‘upgrade’ even though it will see you’re using ESXi now instead of ESX. In other words, some database records are not updated or removed from the vCenter database. When you remove a host from your cluster, the vCenter Agent is uninstalled and vCenter removes it’s host info from it’s database. When you re-add your host to the cluster, it’s like a new host to vCenter. Thus it installs the vCenter Agent and creates new records in it’s database. 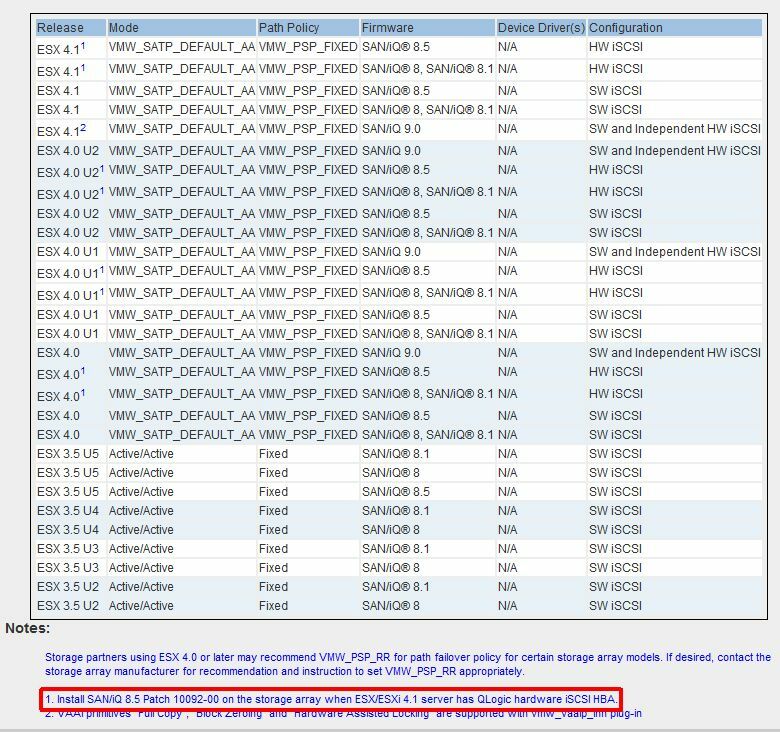 If you’re adding an ESXi host, it will not create a record for the Service Console. We are using a HP Lefthand cluster consisting of 2 P4500 devices with about 8TB usable storage. While testing, our ESX host experienced loss of connection to the Lefthand SAN right after the upgrade to ESXi 4.1. Repeated events occurred in the event log stating that ‘access to the volume was lost’ and ‘successfully restored’ right after. After some searching I noticed a small note on one of VMware’s HCL pages: 1. Install SAN/iQ 8.5 Patch 10092-00 on the storage array when ESX/ESXi 4.1 server has QLogic hardware iSCSI HBA. As it happend, we are using QLogic QLA4052C HBA’s and our Lefthands were running SAN/IQ 8.1. Here’s the link to the patch release notes. Needless to say, we aborted our tests and planned for the SAN upgrade first (we initially planned to do it after the ESX upgrade). We opted to go for SAN/IQ version 9.0 because we wanted to make use of VMware VAAI. Before the SAN upgrade I made sure ALL our QLogic HBA’s had the exact same BIOS and firmware, including our spare parts. 2 Weeks later we upgraded the Lefthand SAN. There was only one problem with the new SAN/IQ 9.0 software. The Queue Depth Total Performance Monitor values for the cluster are now increasing by their nodes values. The values has become cumulative and is therefor now useless. When we noticed it, however, it didn’t seem to reflect the performance of the SAN at all. Everything was running fine. We checked with HP and confirmed this is a UI bug only. HP confirmed that it will be fixed in a future patch. We decided not to downgrade to SAN/IQ 8.5 because the ‘pros’ outweigh the ‘con’. After about 3-4 days I started to test the ESXi 4.1 upgrade again. This time we had no problems. 1 Week later we upgraded 1 ESX cluster to ESXi 4.1. The next week we upgraded our second cluster. The upgrade went smooth. We are now using VAAI and are quite happy with the overall performance.